Note: This is a follow-up to a post I did on How Silos are hurting your startup. Have you read it already? We will both get more out of this post if you read the other one first. You will get the backstory. I can assume you know it. Win-Win. Go on. We will wait for you. Hi again. I hope I have made the case for why silos are hurting your startup. Here is a little trick to help break down silos. The best thing we can do against silos is let camaraderie and friendship develop between employees of different departments. How do friendships develop? Initially, by chit-chatting to each other. By taking an interest. By bonding through the art of conversation. More than one. Repeated display of interest between amicable individuals is the surest sign to a budding friendship. There is a very important part to a conversation of people getting to know each other. Their names. This is true. And so is the opposite. There is nothing more hindering for friendship than if one person does not know the other persons name. Some people are very good at this. Were they born with this ability? Did they learn it somehow? I do not know. I noticed this being a hindrance several times. There were people I was genuinely interested in talking to. But I could not. They had told me their name. I had told them mine. They likely could remember mine. If I struck up a conversation, it would get awkward. So I did not. When a new employee joins, a polaroid is taken of them. They write their name on it. Possibly also a little doodle. It is fun. It is old-school. It looks great in the office. It helps with a feeling of “one big family”. And when someone forgets the name of another employee, all they have to do is take a cup of coffee. Study the wall. Learn the name. Then go make new friends. 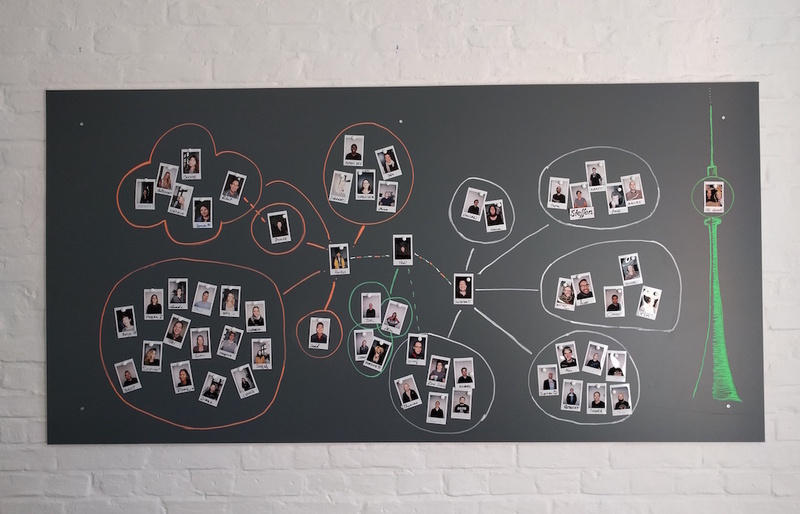 This is why your startup needs a polaroid wall. PS: I highly recommend the Fujifilm Instax Mini 8 instant camera. I have one myself, and it is just the right size for a company wall. Find a digital camera. Who had it last? What event was it used at? Ok, here it is. Now upload it to a computer. It does not look good enough. This is a public branding page. We must look good to the public. Now upload it to the website. Oh, you need IT to do that? They are too busy developing features. File a ticket for updating the employee page. I know, I know, maybe all of the above hassle does not apply to your company. Then you are one of the lucky few. Trust me on this. At Crealytics, the process would be much simpler. A polaroid wall is still superior. Get a polaroid wall. Your silos will be a little less powerful for it.